Qt's painting system is able to render vector graphics, images, and outline font-based text with sub-pixel accuracy using anti-aliasing to improve rendering quality. These examples show the most common techniques that are used when painting with Qt, from basic concepts such as drawing simple primitives to the use of transformations. Demonstrates how Composition Modes work in QPainter. Shows how gradients can be used with QPainter. The Painter Paths example shows how painter paths can be used to beuild complex shapes for rendering. 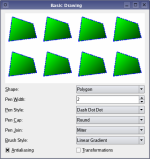 The Transformations example shows how transformations influence the way that QPainter renders graphics primitives.